The research for this collection began by questioning traditional views of femininity and gender. I looked at a Jewellery making supplier Christmas 2015 catalogue, found the double page dedicated “to her” and hesitated between bursting in laughter or crying. It was filled with pink pliers, sparkling hearts, strings of perfect round pearls and kitten motifs. From this page emerged an exploration on gender representation, symbols of femininity within jewellery and their apparent lack of evolution throughout the years. I found gender is a social construction which comes with a set of rules to adhere to, however these laws are not broad or flexible enough. Why not be more playful with those rules to really express who you want to be today and re-invent yourself tomorrow? My collection aims to raise questions about identity and how we can choose to express it through adornment and more specifically jewellery. I was influenced during my researches by people like Iris Apfel who act with an enviable freedom when it comes to dressing up. She always has colourful clothes and big accessories. The purpose of the collection was not to create more rules or tell people what to do but try to make them challenge their choices with humour and hopefully help them to become more playful with jewellery. The Brain ring, 2016; fine silver, vitreous enamel, green topaze. I developed a body of work which is mainly based on contrasts: man-made/nature-made; delicate/heavy; bright colours/pastel colours. I chose to work with traditional jewellery techniques such as wax carving and enamelling, because they are techniques which people are familiar with. I can then use them more boldly and create a new visual language for the viewer. My aim is to make the wearer engage with each piece of jewellery by interacting with the hidden and moving parts. The element of surprise in my work helps the viewer ask himself questions as he is never completely sure what he is looking at. I am partly using ready-made pieces which I cast which reference a lot of objects from my environment in the city. It makes my pieces recognisable for the public and at the same time different from what they already know. My work wants to question gender, identity, the objects and environment we use to define ourselves without giving any definite answers. The colours used are the primary colours because they are the base to create all the other colours as if you were given the basis to create your own identity. It is necessary to notice that colours are an important part of my work and therefore chosen very carefully, as they all respond to each other which makes the collection visually cohesive. I built up this collection with a narrative in mind so that each piece has a specific order. It is divided in three parts as follow: an opening piece, two mini-series (each constituted of a brooch, a ring and a necklace) and a closing piece. The collection starts with the Brain ring: as everything we think about identity comes from our brain. It is symbolically opening the story on the Pearl Series which was inspired by the iconic string of pearls that every “real” woman is supposed to own. Instead of focusing on finding the perfectly round pearls, I focused on baroque pearls, shaped randomly by nature and incredibly beautiful to me. I paired the pearls with different toys to create pieces celebrating imperfections, the act of creation and the feeling of being different. The Bricks series follows and it is based on the contrast between the constructed part (symbolised by bricks) and the natural/biological part (symbolised by plants) of gender. The collection finishes with a massive pendant, regrouping all the symbols previously used emanating from the brain. The choice is left to the viewer to adopt one those metaphors, to wear them all or to create his own. It also ties up the whole collection all the way back to the starting point: the brain. Now it is your turn to play with your identity and I hope you will enjoy it! The Brick brooch, 2016; fine silver, steel wire, vitreous enamel. 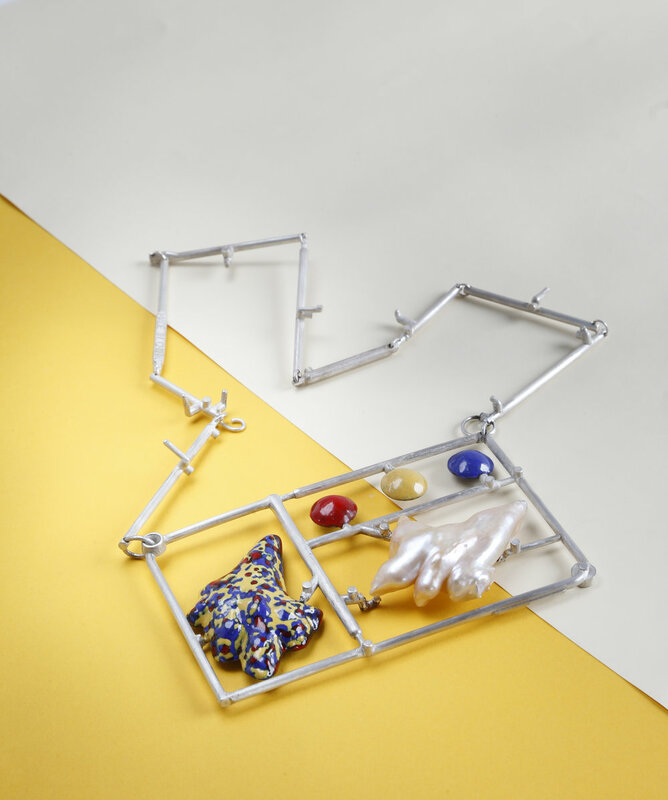 The Brick necklace, 2016; silver, vitreous enamel, gemstones. The Brick ring, 2016; fine silver, vitreous enamel, one baroque freshwater pearl. The Abacus brooch, 2016; silver, nickel wire, steel wire, freshwater pearls, one keshi dyed pearl. The Pearl ring, 2016; silver, copper, vitreous enamel, one baroque freshwater pearl. The Pearl necklace, 2016; silver, copper, vitreous enamel, one baroque freshwater pearl. The back of the Brick brooch is your secret garden. Each brick spins around so you can choose what to show or hide. The Brain pendant, 2016; fine silver, copper, vitreous enamel, two baroque freshwater pearls.